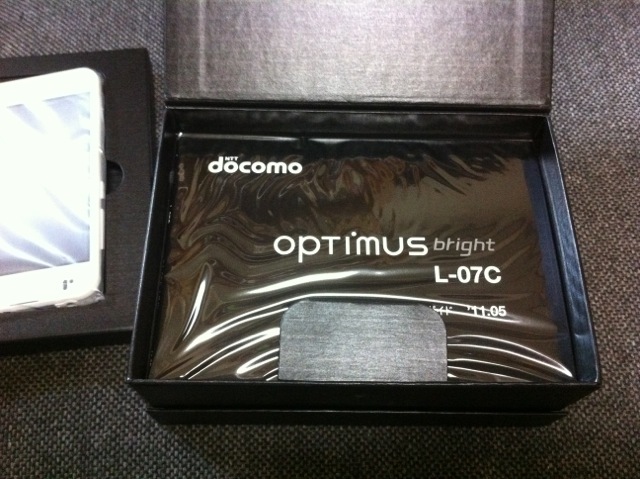 For Android app testing, I purchased a new DoCoMo LG Optimus Bright L-07C from Yahoo Auctions. It arrived this morning, New Year’s Day and I’ve been playing with it. Just released in June, the specs are fairly good I think for the time (Android 2.3, 5 megapixel camera, 4″ 480 x 800 screen, all the usual GPS, etc., sensors and so on). 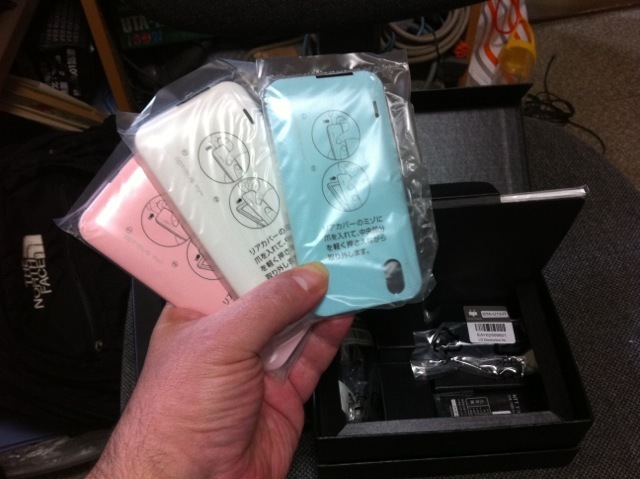 Of course Japanese models turn over quickly and people want one-seg TV and keitai wallets, so they are selling brand new at auction sites at low prices now. Typically the auctions have a “buy now” price of about 12,000 yen, and the auction prices bid near that. Mine had a “buy now” price of 13,000 yen ($162.50) including shipping, and when the price rose to 12,000 yen I just snapped it up. Some of the auctions don’t include shipping. And some of the Optimus Brights being sold did not include all the standard included accessories, such as the microSDHC card. But this one included everything. The review on this model are “so-do” because specs are changing so quickly. But it seemed more than sufficient for my testing work. I wasn’t expecting much, but was very pleasantly surprised. (1) The box it came in. This is the box wrapper. 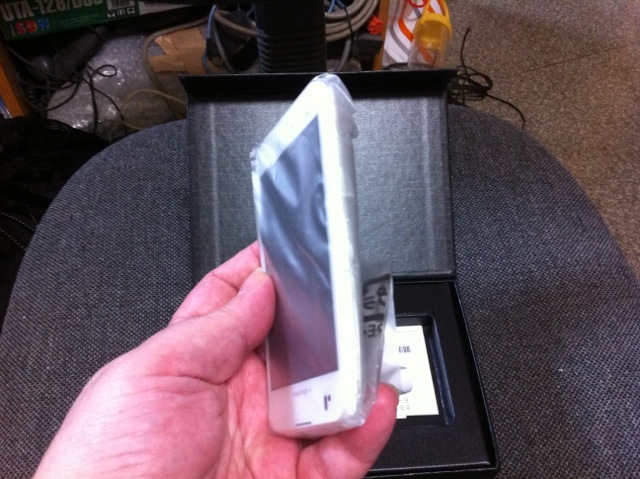 (2) The inner box, after removing the box wrapper. 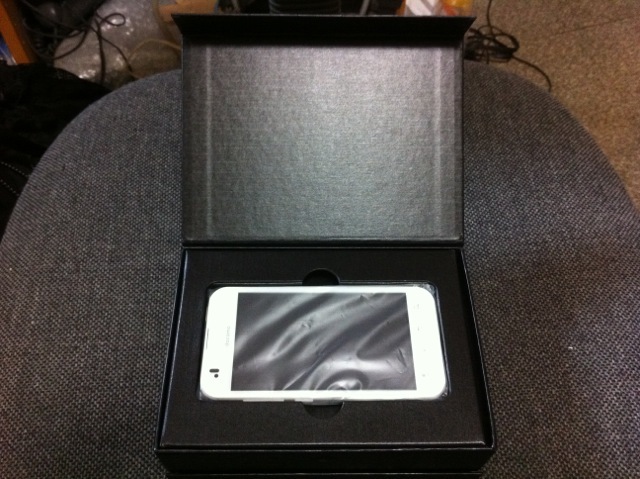 (3) Opening the box. There it is! (4) First impressions: it is very light and thin! It weighs noticeably less than my iPhone 4 and is thinner than the iPhone 4. It also has a larger screen: 4″. (5) Lifting up the tab the owner’s manual is just below it. (6) It comes with three back covers, depending on your mood. I am in a “white cover mood” today. 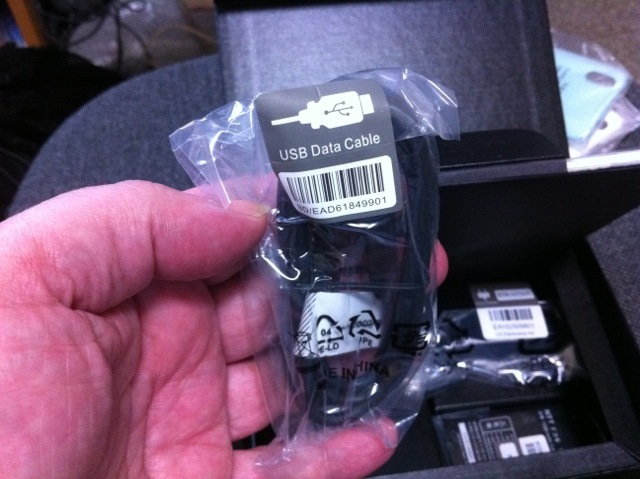 (7) The USB data cable connects to the power adapter or directly to a USB port on your computer. I still haven’t investigated what all can be done when mounted directly with the USB cable. 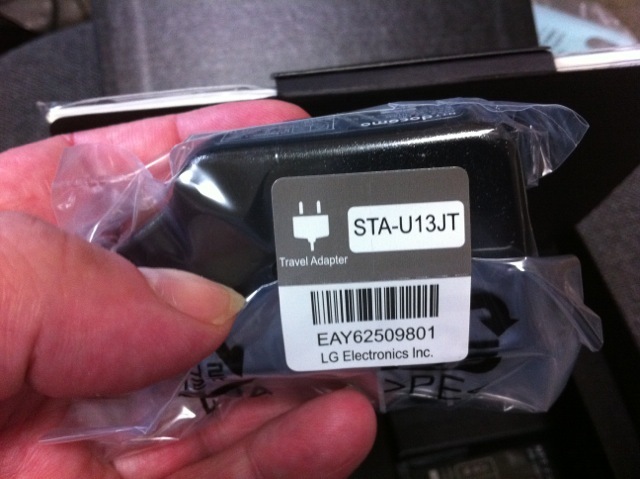 (8) The travel power adapter. 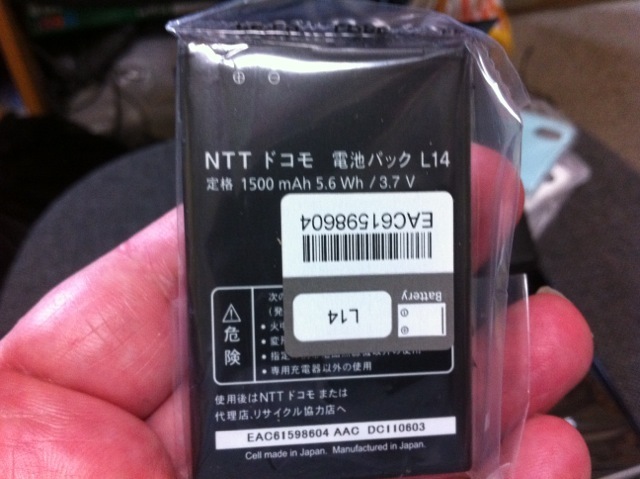 (9) The replaceable battery back. This is also very thin and light. 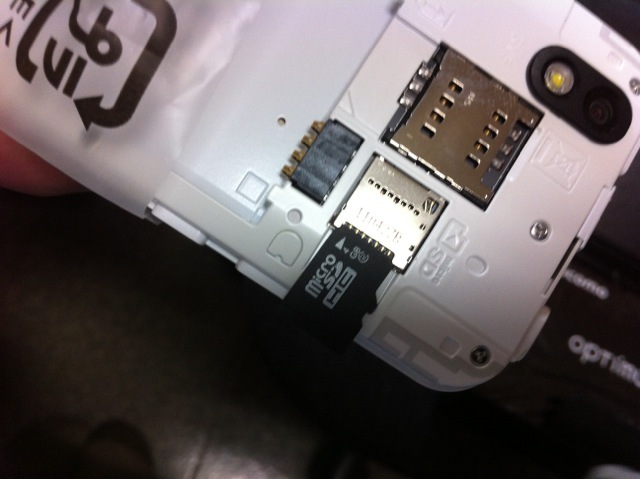 (10) The LG Optimus Bright comes standard with a 4 GB microSDHC card. It even says so in the manual. So if you are looking for one online, make sure it includes this. Some sellers are not including it. One tried to tell me, “It doesn’t come with one, but I’ll include a 2 GB one for you.” So do be careful. This is supposed to be standard. (11) It immediately turned on. First impressions: The screen is very large, easy to read and bright. And I am still amazed by how light it is, even with the battery installed. (Note: I didn’t realize when taking all these photos that the protective film was still on the screen.) The screen itself is actually very sharp, which doesn’t necessarily show up well in these photos taken with my iPhone 4. (12) The first screen that pops up lets you choose your language. I chose English. (13) The setup is really easy. It takes you screen-by-screen through the most obviously needed settings. The next screen was the wi-fi setup, and I connected to my home wi-fi. (14) Next you are given a chance to add a Google account. By the by, I later changed to a QWERTY keyboard. (15) The next slide gives some UI advice – then you are ready to go! (16) Some of the pre-installed apps. (17) This was interesting. Some of my photos were already in the Gallery. I guess it syncs what it can from the Google account I signed in with. (18) Similarly, my contacts automatically appeared. I guess anything that ran through Gmail. Scary! Clicking on a contact let me send email. (19) I connected the USB cable to charge. It “pinged” at me when it was done and recommended unplugging it to save energy. (20) This compares the screen open to the same Evernote note on my iPhone 4. The Optimus is brighter and larger. The iPhone 4 has a higher resolution, so shows more info without sliding. I do have to say the Optimus Bright is very easy to read. – You can’t see it well here, but the LG Optimus Bright includes four “buttons” on the bottom: (1) a context-sensitive menu, (2) home, (3) go back , (4) search. I took a little movie I’ll put up. These are fixed “buttons” but are flat. There are no moving parts there. There is a proximity sensor so when you put your hand close it temporarily backlights the buttons a bit. – I have another movie showing the nice effect when it switches between landscape and portrait mode. – There is a little “G” (gesture) button on the side. If you hold it down, you can perform certain gestures without actually touching the phone. For example, if you tilt the phone left, the screens slide left and so on. Sort of interesting. – I haven’t tried all the apps yet, but did try maps. It lets you do a rotate gesture with two fingers in addition to pinch in and out, which is very cool. The iPhone version doesn’t have that feature. Anyway, I am pleased. I wasn’t expecting much at all yet it seems like a great bargain for a no-contract phone. Web pages load quickly, mail works, the camera works fine. I’ll upload more later on. (I wonder if I can unlock this and use it on travel in the U.S. since I can’t unlock my iPhone). Doug, It is way beyond my understanding of these technical things but enjoy. Hi. I have not attempted to root it yet, so I’m afraid I can’t help you there. I was trying not to root it because I wanted it to work as closely as possible to a customer’s device for web dev testing. I’m sure there are lots of problems with the phone – which is why after just 6 months it became available at low prices at auction sites. For me, it suited my purpose because I just needed it to check some web development and my customer was also using Android 2.x devices. I only use it with wi-fi. I have no phone contract. Another problem I’ve noticed is the battery drains rather quickly. I do not have idea on the price…this guy took BDT 22,000 = Yen 21,600 …he shipped it from Japan to Bangladesh. Frankly speaking there is no android phone at this price range in Bangladesh at this speed and resolution. So I went for it seeing it first with a friend of mine. Any idea how to counter this ? Are Android phones in general very expensive in Bangladesh? I wonder why. I am sorry I don’t know the answer to your question though. I don’t know what USSD is! This isn’t really an “Android Forum” – just my blog. I was just posting about my personal impressions of the phone I got for web development. RE: SMS with more than 160 characters, get GO SMS Pro. it will allow you to send longer messages. The App will divide your messages for you. How u doin’ buddy? I bought the same device a few days ago. Sad to say though, I couldn’t download anything from google play store/ Android Market. When I tap to download the app it says “colud not be downloaded due to an error. (403)”. Do you know how this problem works out? I hope you could help me on this issue Doug. Love your blogs by the be way. Sorry, I haven’t had that problem. I don’t know what the error might be. Are you connected via 3G or via wi-fi? I don’t have a phone contract with any cellular provider, so just use mine over wi-fi. The only time I had a problem downloading an app was for a while with Evernote. But that turned out to be an Evernote bug and they fixed it. Have you been trying different apps? 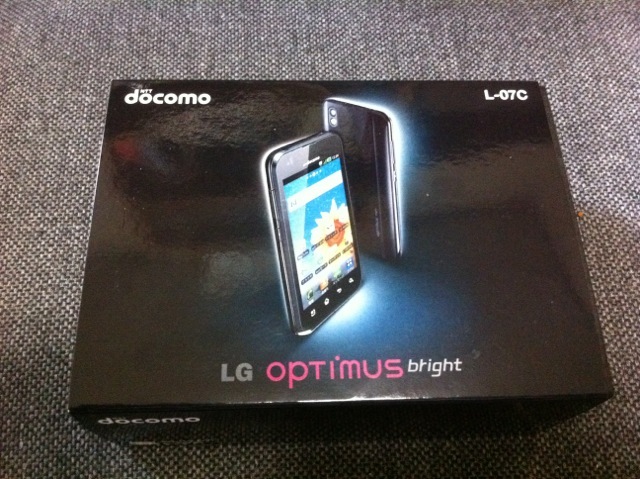 I too have lg optimus bright l-07c(docomo)phone. now i’m in sri lanka, i can’t get calls using it, that means can’t work with sim cards, it shaows “network loked” do you know to unlock it, i bought unlock code from ebay but i don’t know to enter it to right place, to where i should enter it? Hi, Shamin. Unfortunately I am using my Optimus bright over wi-fi only, so have no info on getting it to work with a SIM card. DoCoMo will unlock their phones for a small fee, so you don’t have to buy unlock codes off of eBay. You can actually walk into a DoCoMo shop here in Japan and say, “Please unlock this for me.” They are the only cell phone provider in Japan to do this. Beyond that, I really don’t have any information. Yes, I’m douglerner on FaceBook. this is my facebook id. send me a reqest. i want to do a private deal. I am also using the same in Bangladesh. But a great problem is can’t use short code like check balance, mobile banking etc. If I try *778# to check balance then a msg appear “MMI code canceled”, don’t know why???? If anybody can give me solution, it will be helpful for me. why is it my docomo lg optimus l07c show a no network after, but i already sent a sms message here.. what will i do? do i need ro go to settings.. But I will say I might not know the answer. It works for me. Perhaps some setting is getting reset. If you go to Settings > Sound have you gone through all the settings to make sure they are correct? In particular, did you make sure not to check Silent mode? Also, is the ringer volume on the left side set high enough to hear? I don’t know. What about other apps which require an Internet connection. And what about other wifi devices – do they work ok on your wifi network? If other apps which require an Internet connection work it must be a browser setting I am not familiar with. Can you try installing a different browser as a test? How Many Price In India? I also have this phone. I have the same problem with Jarel but I was only able to use the phone for 2 months for texting and making calls but later on it says no network and all my contacts on my sim card cant be seen. I cant send texts and make calls too. But the other features are okay. When I tried to go to settings>wireless&networks>mobile networks>data enabled(enable data access over mobile network)–it was grayed out. When I also tried to go to settings>locaTION&security>set up sim card lock>lock sim card has been checked eventhough I didnt change any setting. Please help me with this. I also tried to see this to a technician but he cant get the screws of the phone. pleaase helllllllllllllppppppppp..
hi dheyie..what problem did u mean that u had already experienced? Sorry to hear that. 🙁 As you know, I only got mine to use over wi-fi for testing, so I’m afraid I have no solutions either. I cant browse website even if my wifi signal is excellent. What can I do to? hope you could help me. i have display problem with my L-07c. sathishkumar? what problem is it? boot screen? software loading everything its fine. I am using L-07c in Bangladesh. I update the software and now running 2.3.3, baseband version V10e. I tried a lot to root the device but failed. Pls. help me….how to root the device. before updating to v10e from v10c, i can root/unroot with oneclickroot. But after updating it is not working. Now I will try with Flash….thanks for that. 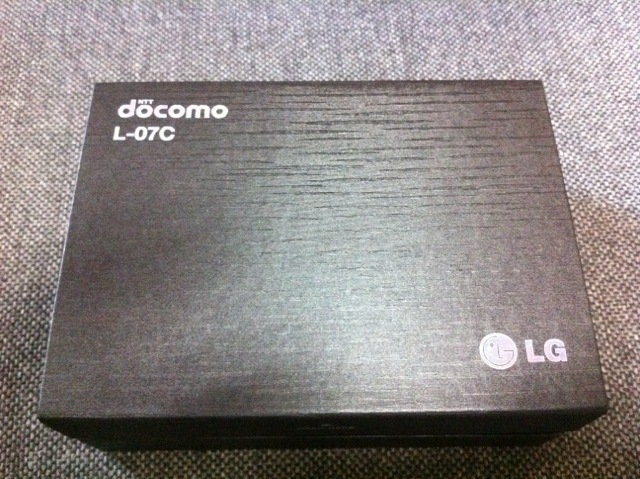 But it is for P970 model, will it work for L07c??? Would u pls. let me know from where I can download ROM- zeus/marvel ?? Is there any risk to flash my cell ? How can i install custom-ROM? After flash, I can’t call, even I press 0 on dial pad then a screen “device test” appear. what to do? I tried a lot, but recovery mode not coming. earlier I used to vol-,G & power button but not working that also. After flashing i used factory re-set from Privacy. can’t go to reovery mode. Now no network found for my airtel sim. I can’t call/rcve, but all other options/applications are OK. I tried a lot but failed to run my L07c as P970, it looks like OK and all applications run without calling (incoming & outgoing). I can’t boot also in recovery mood. I think some kind of lock (Bangladesh)with my network (I am noob). Now again I install my original stock ‘V10d’, but I don’t like it and I can’t root also with superoneclick. I want to try with gingerbread, pls. let me know your opinion, thanks. yes IMEI is missing from my mobile. But that link is for P920/P940. will L07c work on it? I lost my IMEI from L07c. Can’t connect with any terminal program (tutty) with PC. Pls. help to connect…I am noob. I didn’t have any particular problems with the LG Optimus Bright. But please note that it is already quite old, and stuck at Android 2.3.3. For that reason alone I would not recommend it as a new purchase. Time has passed and if you are buying a new Android phone I believe it is time to consider a newer model! can this phone be use in internet using mobile. i mean no wifi just some regular load? i have this phone too. Yes, if you have a data plan. 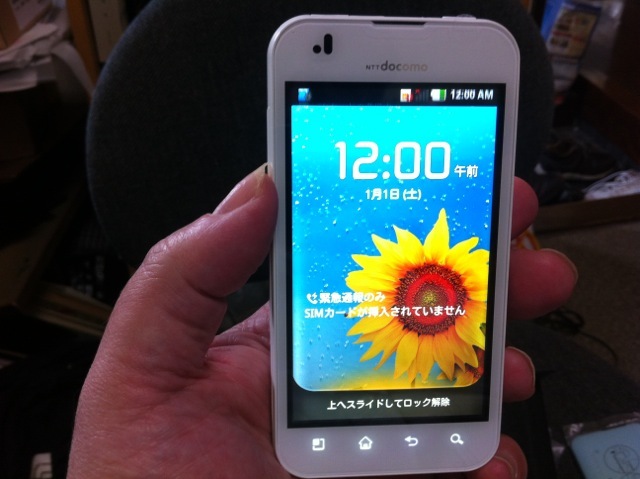 It’s an Android phone, so you can use it for web surfing, running apps like Facebook, etc. Hi I also have the same phone and it came from japan I was able to use it for texting and making phone calls here in the Philippines only for about 3 months or so but later on it then had a problem no network then I can’t send texts and make calls anymore do you think it’s possible that it can be reactivated or something.. can you help me? I am facing problem…but nobody can solve it. From my L07c IMEI is missing while I was updating the software. 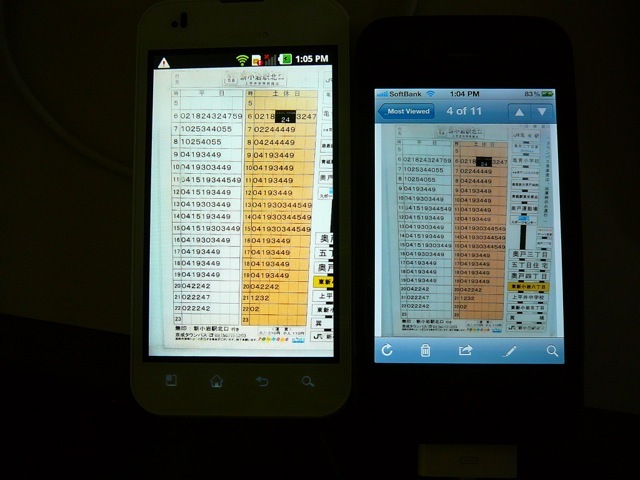 IMEI show “unknown” and baseband also show “unknown”. I re-flashed stock rom but same thing appears. Now my phone became brick. my memory card is not coming out in the notification bar..it says that insert new memory card even though it has memory card..why is that like that? ?i also tried changing the memory flex/ribbon thing..but it doesn’t work..pls.help me..i need an answer for that..tnx..